Super Hero Fun at the Captatin America 10K! With the fun of Expo day behind me, I was up at 2:30am to get ready to take on the Inaugural Captain America 10K at Disneyland! Fall had finally arrived in Southern California. It was freezing cold when I arrived for this race (at least for this Southern Californian). As I got off the elevator at the Mickey and Friends Parking Structure, I saw my friend AJ and walked to the pre-race area with him and Ivie. It’s kind of crazy how much I run into these guys at runDisney races! I hung out with them for a while. They were running the races for charity and had to meet up with others who were running for the same charity. So, I wandered around for a little bit and saw Patty from My No Guilt Life! We chatted a little bit. She had an awesome Captain America costume. After chatting with Patty, I was ready to head off to the starting corrals. As I was people watching in the corral, I saw my friends Gail and Kim as they were heading to their corral. We got to chat for a little bit and they were off to their corral. After chatting with Gail and Kim, I saw AJ and Ivie. So, I hung out with them until the start of the race. Unfortunately. in the 5K and 10K, we only get Rudy and Carissa for the first corral or two. Then, one of them has to head off to the finish to be there for the speedsters. After Carissa left, only Rudy was still there to send us off. It’s all good. Rudy is a fantastic race announcer. As we got close to the start line, I was feeling all the excitement of another 10K at Disneyland! I was rehearsing my plan in my head. One part of the plan I didn’t expect was that I forgot my headphones in the car. So, I’d be running this race without music. Let’s just say, that bummed me out. I’ve never run any race without my wife without music. So, this would be interesting. For this race, I’d play it by ear and see how I felt after a mile or two before commuting to a time goal. At the start, it was just going to be sticking to my run 45 seconds, walk 45 seconds intervals. Could I do it without the music? Let’s find out…. Then, before I knew it, we were off! Bye Rudy! See you at the finish line! The first half mile was filled with crazy intervals. The course was rather crowded at the start. So much so that I wondered if it was worth it to pretend to run when I could just walk the same pace. It wasn’t until I got to Disneyland Way and Katella that the course started to open enough to think about intervals. As I passed Katella, I saw another run blogger that I follow named Jindy. We first met in person during the Disneyland Half Marathon. So, I said a quick hello and we chatted a bit. It’s kind of fun doing these races when I know so many of the runners! We got to the 1 mile marker and I was at around 11 minutes. This time the 1st mile marker was placed correctly. One bummer is that the mile marker was off the course in a place we weren’t supposed to be running. That didn’t stop runners from going over and getting their picture with it. I kept on running. By this point, we were entering the Anaheim Convention Center. I was feeling pretty good. The first mile wasn’t too fast. It was right on point with what I was used to. Since the mile marker was placed better, I felt good about what the second mile would bring. I kept my run/walk intervals going. It felt better than when I ran the same course for the Disneyland 10K. By the time we got to Harbor Blvd., I was joined by a woman that I met prior to the start. She asked what my time goal was. I told her I was aiming to keep a 45/45 run/walk intervals. I lost a little bit of time in mile 2 but still felt good. Mile 3 started our journey in the parks! Cars Land was all decked out for the holidays! Honestly, it’s always fun to run up Route 66! There were no characters out in Cars Land. Not that I would have stopped. I just wanted to make a note of that. As we exited Cars Land and made the turn towards the Pacific Warf area, we came to the first character stop…Black Widow (I think). The line looked too long for me to wait and I had no interest in a picture with Black Widow. You know I’m thinking about time when I don’t take a lot of photos. My time was still looking good in mile 3. So, as we made our way up past Ariel’s Grotto and to the Paradise Pier area, there was no stopping the intervals. I did think about getting a picture by Toy Story Mania. However, I was too into seeing what kind of time I would get. At the end of the Paradise Pier, I saw the signs for Viva Navidad! If you’re ever at DCA for the holidays, I highly recommend checking out this celebration. The whole way around the pier, I was trying to decide where to get the mandatory picture with Mickey’s Fun Wheel. After all, the World of Color Fountains were going. So worth the time to stop for this pic! At the Voyage of the Little Mermaid, we turned to run through the Grizzly River Creek area and onto Condor Flats. That’s where we finished the third mile. I was still a little slow. I crossed the 5K mat at 37:53. It felt like I was a little faster than I did at the Disneyland 10K! Could I actually set a new 10K PR? Hmmm. Keep the intervals going all the way through Hollywood Land! We made our way down Hollywood Land and on towards the Hollywood Tower of Terror. I skipped a picture here during the Disneyland 10K. So, I thought it would be fun to stop for one on the Captain America 10K. As I was taking the picture, another running friend Erica passed by. I was on a walk break while she was running. So, there would be no catching her. We made our way backstage DCA to the tunnel that connects backstage DCA with backstage Disneyland. They had some fun music playing in the tunnel! Score. As I ran through this area, I could feel like my pace was slowing. As we made our way to Disneyland’s entrance, I thought to myself…what’s up with mile 4? This was my undoing at the Disneyland 10K. Even with that thought, I reminded myself that I shouldn’t have given up because I wasn’t too far off my PR at the Disneyland 10K. Maybe this time would work out better if I kept the intervals going. It’s always a magical moment when we enter Disneyland. I love running up Main Street U.S.A.! As I got close to the Hub on Main Street U.S.A., I briefly thought of getting a picture with the Partners Statue. But, I decided to skip it. My time was getting away from me a little bit. So, I only stopped to get this picture. and Star Wars Launch Bay! I wished I could have remembered my time at the mile 4 marker during the Disneyland 10K. It seemed like I was either right on pace with that race or, maybe, a little quicker. It was at this point during the Disneyland 10K, I gave up a little. I did not want a repeat. So, I kept my intervals going. I made my way up to It’s A Small World: Holiday! On the way, I passed Hawkeye. The line was way too long for my liking. So, I easily skipped it. We made our way backstage behind It’s A Small World. I was still pushing for my intervals. This sign was way too cool to not stop for a picture. Yes, it added a few seconds as I waited for a clear shot. But, it was so worth it! I had to shorten a walk break or two to get back on track with my inervals. However, even though tiredness was setting in, I didn’t want to give up on the intervals. 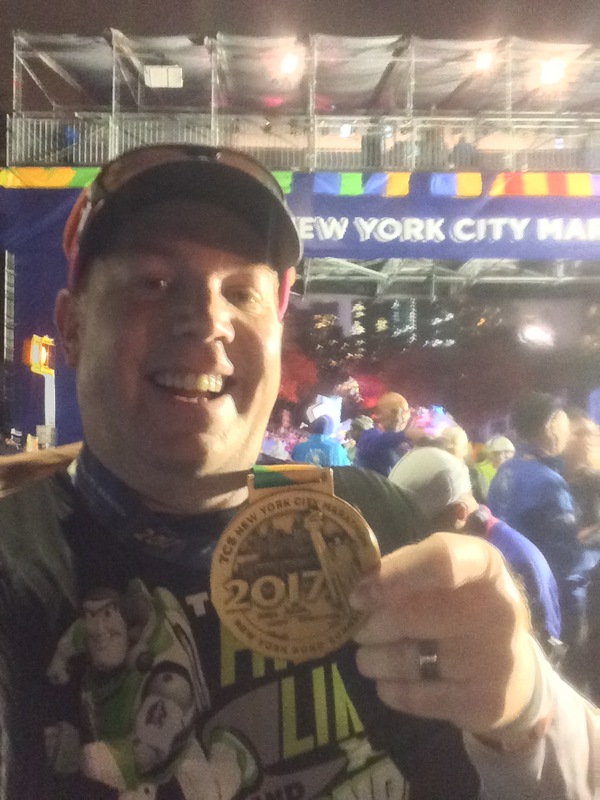 I wanted to learn my lesson from the Disneyland 10K and keep pushing. Backstage Disneyland, they have some fun parade stuff out. Since I didn’t make it out for the Halloweentime at Disneyland this year, it was hard not to get a quick pic with the Mickey Jack o Lantern. Another part of the course that I absolutely love is running through Toontown. It’s such a short part of the course. However, it was all decked out for the holidays. So, I had to get a quick pic. We made our way back to Fantasyland and got ready to run through Sleeping Beauty’s Castle. I am a little bummed that they don’t have the fake snow this year. Since Marathonfoto never seems to get a picture of me coming through Sleeping Beauty’s Castle, I always want to get one myself. By the time I got done with this picture, I had totally lost track of where I was supposed to be with my intervals. Funny thing is that I was not alone. As we approached Frontierland, I heard another runner say the same thing. When was I supposed to run again? By the time I got to Frontierland, I was sure I wouldn’t PR. However, I was still on track to match or best my Disneyland 10K time. Then, it happened. As we got to the Golden Horseshoe, I saw the shortest line of the entire race. Guess who it was for? Yep. Captain America. I asked a Cast member how long she thought the line was. She said, 10 minutes. Big dilema. Do I go for time or fun? This was the Captain America 10K. How could I pass up such a short line for a pic with Captain America himself in his race. It was too much to pass up on. So, I got in line and waited for my pic. It cost me my time goals, but was sooooooooo worth it! With my time goals behind me, I was going to have as much fun as I could in the last mile. So, I stopped for pic with the Nightmare Before Christmas Haunted Mansion overlay. I got a pic for another couple and they took mine. What was really fun about this is that, after I got my pic, I had a couple come up to me to let me know they read my blog! It’s always fun to meet folks who take the time to read my ramblings. We made our way past Splash Mountain and through Critter Country and backstage Disneyland. Then, it was on to the Esplanade and Downtown Disney. I kept my run/walk intervals going. Even though I wouldn’t finish with an ideal time, I still wanted to run like I was running for time. As we passed the 6 mile marker, I saw the Christmas tree and Olaf’s Ice Rink. So, I made my way over to snap a quick pic. After all, my overall time was out the window. So, I had to have fun. From there, I made the final turn to the finish line. Time to run to the finish! And just like that, the Inaugural Captain America 10K was in the books! My official finish time was 1:24:19. I’m totally proud of that time. If I didn’t stop for the pic with Cap, I would have been oh close to a 10K PR and would have finished ahead of my Disneyland 10K time. That’s why I’m proud of this time. I made the decision to stop and it was totally worth it. Sometimes you’ve jut gotta have fun. The person giving me my medal didn’t want to be in the pic. But, it’s still a fun pic to get. If you have a phone or camera with you and can take the selfie, there are a lot of volunteers that love being in this kind of a picture. Part 1 of the Infinity Gauntlet Challenge was complete. Don’t you love the medal? The only thing that would make it better is if it was in color. After the race, I wanted to see if I could see any of my friends who I thought might finish after me. Remember the couple that I saw at the Nightmare Before Christmas Haunted Mansion? This is that couple. It was great to talk with them after the race and they had finished. Hearing other people tell you that you’ve inspired them is one of the most humbling things you’ll ever hear. I write this blog to keep track of all my training and interact with others. I never think of myself as an inspiration. So, yeah. It was humbling to hear that. After chatting, I made my way back to see my friends Kim and Gail come out of the finishers chute. These ladies are like runDisney royalty, super fun people, and really encouraging. If you haven’t met Kim or Gail yet, make it a mission on your next runDisney race to meet them. After chatting with the ladies, I was off to my car to change. I knew getting out of the Mickey and Friends parking structure would be a nightmare right after the race. So, after changing, I headed off to DCA for a real breakfast. Yep. Breakfast of Champions at Flo’s V-8 Cafe in Cars Land. The best part of this breakfast? The view I had. Not bad. Don’t you think? I’ve never been to any theme park for the rope drop. I was actually surprised that they let us into DCA before the 9am opening. The line to get FastPasses for the Radiator Springs Racers was already very long (even at the rope drop). By the time I got to Cars Land, the line for the racers was already quite long. So glad I wasn’t planning on riding. After eating at Flo’s, I did a few attractions. The finishing one was the Frozen sing-along. By the time I got out, enough time had passed and I was feeling tired and ready to head home. It was a fantastic day of racing, seeing running friends, and hanging out at DCA. Not a bad way to spend a Saturday! Thanks for the write-ups and pictures. Fun reading. Good job running! great recap and great pic with Cap!! That was the last weekend to take a pic of him (He is out on a mission right now so Spiderman is in SuperHero HQ!). I love the 10ks-always so many photo stops!